Draw inspiration from the stories you read and relished as a child—ones you’ll certainly read to your little one someday, too. At Budget Direct, we have created some fun, fantastical designs to help you get going. Would you like a curvy crib? A pastel dresser for clothes and bibs? Maybe even a lampshade inspired by the Cat in the Hat’s hat? Whatever you base on Dr. Seuss’ The Cat in the Hat, Green Eggs and Ham, or other classics is certain to stand out. Like his illustrations, your designs would marry surreal art with a hint of art deco and the whimsical nature of children’s doodles. 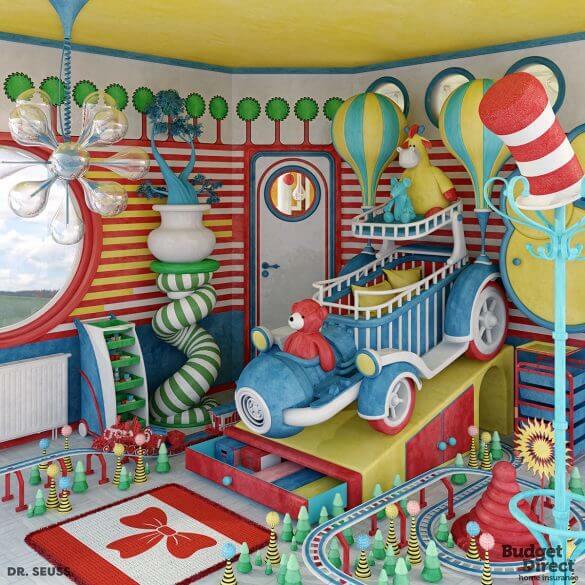 The room would have a flow to it as well, since Seuss favored curving lines to straight ones. The look of The Very Hungry Caterpillar and Carle’s other books would make for a very striking nursery. Bold, colorful collages against simple, white backgrounds would redefine wallpaper. You could incorporate bright, floral elements and all types of animals—from the tiniest of insects to the biggest of bears. The texture Carle adds with a distressed and weathered look could manifest itself in the use of shabby-chic furniture. Monsters should never hide under the bed in a child’s room. They should be out in the open, especially when they’re based on the big-eyed, and even bigger-footed, friendly fiends in maybe the most famous children’s book ever: Maurice Sendak’s Where the Wild Things Are. Another element that would be different in a Sendak-inspired room? The color palette. Instead of the bright colors normally used in a nursery, this one would incorporate muted earth tones to create a warm, natural feel. And the designs would combine the beauty of crosshatched 19th-century prints with the playfulness of cartoons. The author of Alice’s Adventures in Wonderland may have been a mathematician and inventor, but he’s famous for creating some of the most memorable characters in children’s literature. The March Hare, Cheshire Cat, Mad Hatter and Queen of Hearts populated Wonderland, but they’d be perfectly at home in a baby’s nursery as well. Naming the entrance “The Rabbit Hole”, hanging a mobile with the Cheshire Cat’s floating smile, and including a baby bottle that says “Drink Me” seem almost mandatory. In your case, of course, the baby’s milk will help her grow, not shrink. 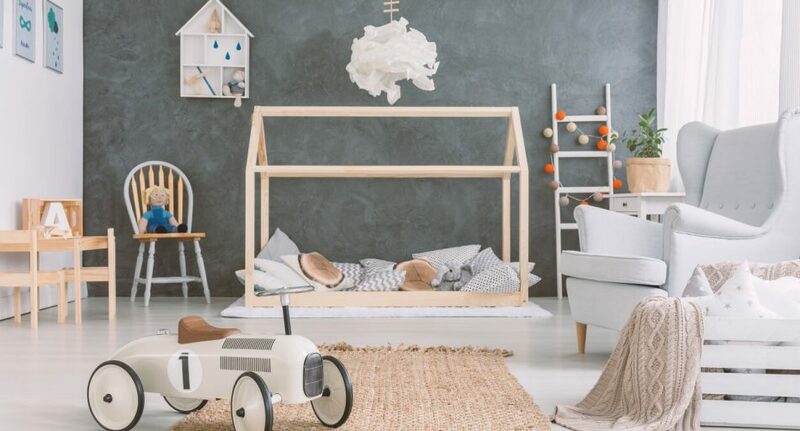 It will take more than the wave of a magic wand to turn your nursery into a room right out of Harry Potter. But the effort will be worth it. Perhaps you’ll be inspired by the medieval, gothic castle that’s home to Hogwarts or by bustling Diagon Alley that’s reminiscent of a charming London street. You’ll work with dark green, burgundy, and other rich colors often associated with elite schools. And while you won’t have an actual Nimbus 2000, you might keep a replica handy to sweep up after the little one. Once upon a time, Hans Christian Andersen wrote fairy tales that didn’t start with “once upon a time.” But they did end up becoming famous by marrying fantasy with contemporary settings. So why not transform your nursery from average to amazing with ducks, swans and a farmyard theme based on The Ugly Duckling? Or create a kingdom under the sea like the one in The Little Mermaid. Or even design the wintry world of The Snow Queen, the tale upon which Frozen is based. Your baby’s room will be as unconventional as Andersen’s fairy tales.